Often we are not able to get a good idea of when a vintage postcard was printed, unless by good fortune there is a postmark and date. In this case, this card entitled "Hollywood, the City of Stars" was sent to Mrs. Wilma McGee (wife of E. J. McGee at East 933 Mission Avenue, Spokane 13 Washington on the 10th of February 1947. Note: The Hollywood Freeway was being put through the Cahuenga Pass at this time. The construction area can be clearly seen with Lake Hollywood Reservoir to its right. Double click on this image, seeing it up close is worth it. "All the world knows of glamorous Hollywood, of its queens of fashion, its stars of the silver screen and radio, its world wide influence in entertainment, art, literature and music. With a background of beautiful foothills and bathed in the brilliance of the California sun, Hollywood si a beautiful city. Wonderful hotels, unique theaters and cafes, charming shops - its broad palm lined avenues which lead the exchanged traveler to the sparkling blue of the Pacific or towering mountain ranges." I always wondered when the Hollywood Fwy was built. It always seemed so old. I don't remember the reservoir either. Is it still there? This is a great image. The Cahuenga Pass Parkway concept was developed by City Engineer, Lloyd Aldrich. Aldrich’s plan include four lanes in each direction, with separation between opposing traffic flows with the Pacific Electric Railroad tracks in the middle. Bridges connecting the service roads and spanning the parkway were constructed at the Pilgrimage (now John Anson Ford) Theater, Mulholland Drive and Barham Boulevard. At the southern end of the Pass, southbound traffic destined to Highland Avenue would stay to the right, while traffic destined to southbound Cahuenga Boulevard would stay in the left two lanes and travel in a tunnel under the Pacific Electric Railroad tracks. The first unit was opened on June 15, 1940 and extended northerly to the Barham Boulevard ramps. By January 1, 1941, the roadway was extended to terminate in a 90° curve connecting with the older segment of Cahuenga Boulevard near Bennett Drive. Cahuenga Boulevard Parkway, a freeway less than two miles long, was opened just one day after the Arroyo Seco Parkway was dedicated. 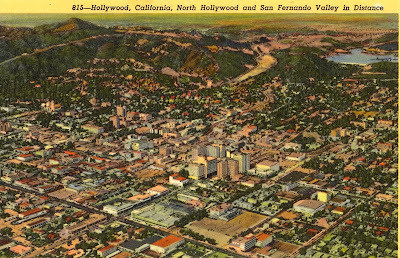 The next phase of extending the parkway to the intersection of Ventura Boulevard and Vineland Avenue was disrupted by World War II, and was completed by the State in 1949. In 1954, Cahuenga Parkway was altered and incorporated into the Hollywood Freeway. This route was LRN 2, started in 1909. While the last phase of the Cahuenga Parkway was being completed, work already was underway on building the Hollywood Freeway. The last segment of the freeway, built in 1954, connected to the south end of the original Cahuenga Parkway. The completion of the Hollywood Freeway necessitated the demolition of the 1940 tunnel connection under the Pacific Electric Railroad tracks between the Pilgrimage bridge and Odin Street (you can find a nice history of the Pilgrimage Bridge here). In addition, since the Pacific Electric Railroad had ceased operation in 1944, the area that it had occupied in the median was reconstructed to accommodate traffic from northbound Highland Avenue. In 1957, when the Hollywood Freeway was extended northwesterly of Lankershim Boulevard, the northbound on-ramp, northbound off-ramp and southbound on-ramp at Barham Boulevard were abandoned. The abandoned ramps have remained preserved since that time. Despite alterations, much of the original Cahuenga Parkway remains intact. The original ornamental street lights on the bridges still look charming. The Pacific Electric Railroad overhead cable hooks can still be seen on the bridges over the area formerly occupied by the tracks. And the ornamental design in the corners of Barham Boulevard bridge remains. So the portion of the freeway near Cahuenga and the bowl was constructed ~1940-1942, yet this postcard is dated 1947 and shows it under construction. Something doesn't fit.